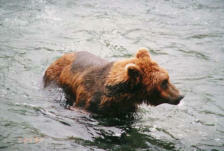 The brown bear is the most widely distributed bear and is found across much of northern Eurasia and North America. It is one of the largest living terrestrial members of the order Carnivora, rivaled in body size only by its close cousin, the polar bear, which is much less variable in size and slightly larger on average. These omnivorous giants tend to be solitary animals, except for females and their cubs, but at times they do congregate. 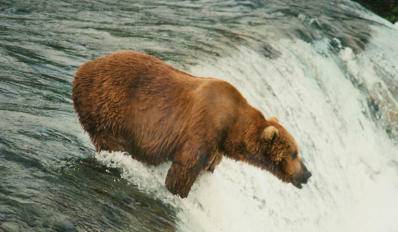 Dramatic gatherings can be seen at prime Alaskan fishing spots when the salmon swim upstream for summer spawning. 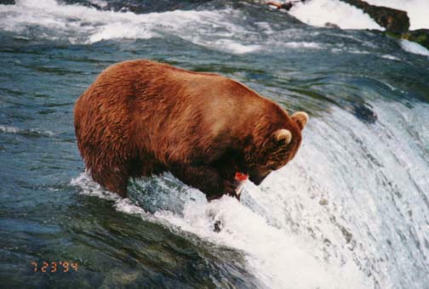 In this season dozens of bears may gather to feast on the fish, craving fats that will sustain them through the long winter ahead. In fall a brown bear may eat as much as 90 pounds of food each day, and it may weigh twice as much before hibernation as it will in spring. 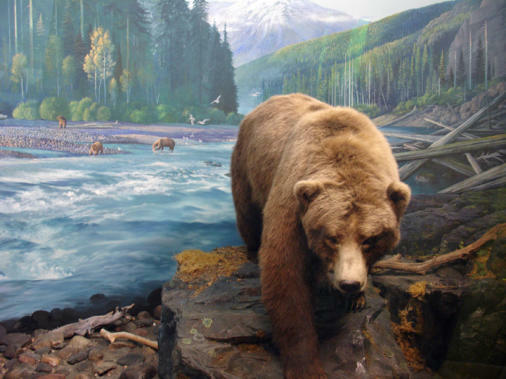 Brown bears dig dens for winter hibernation, often holing up in a suitable hillside. 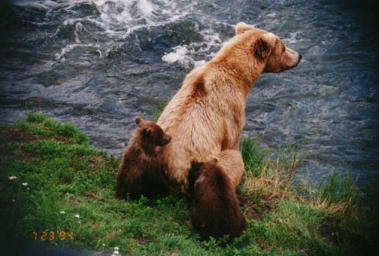 Females, or she-bears, den while pregnant and give birth during this winter rest, usually to a pair of cubs. Brown bear cubs nurse on their mother's milk until spring and stay with her for some two and a half years—so females only reproduce once every three years. Adult brown bears are powerful, top-of-the-food chain predators, but much of their diet consists of nuts, berries, fruit, leaves, and roots. Bears also eat other animals, from rodents to moose. 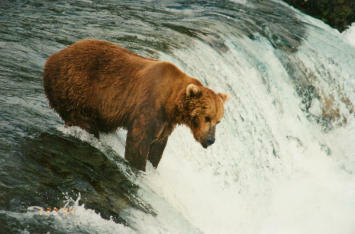 Despite their enormous size, brown bears are extremely fast, having been clocked at speeds of 30 miles per hour. They can be dangerous to humans, particularly if surprised or if a person gets between a mother bear and her cubs.